I received a thank you email from a charity this week – the McGrath Foundation. The subject read “Thank you, Stephen, we couldn’t have done it without you”. McGrath Foundation was not asking for money. The Foundation did not ask me to take any action. The McGrath Foundation simply thanked me. We do not thank each other enough in our personal and professional lives. Charities do not and cannot thank their donors enough. Too often, we as fundraisers have our hand out making an ask for a gift rather than our hand out to thank the donor. Often times a simple thank you will generate an additional gift and even a larger gift. How often does your charity send a thank you to donors without making an ask? Have you picked up the telephone to thank a donor and to simply check to see how they are doing? When was the last time you wrote a hand written thank you note to a donor instead of sending an email? Go the extra mile (kilometre) and see the difference it makes. McGrath Foundation placed a subtle message in their thank you email – the email told me they are halfway to their goal of 110 nurses. I interpret this line as a simple update. I might read that and believe McGrath want me to make a contribution to help the Foundation achieve the goal. I might read it and feel the need to help. McGrath Foundation hopes I feel gratitude by this email and, at the same time, no doubt hopes it generates some needed income. This stewardship email may be a wave as part of a campaign. Nonetheless, the focus of the email is on expressing appreciation and it makes recipients feel good. Managers often argue against investing in the professional development of staff by saying staff turnover makes them shy from sending staff to various external courses or learning opportunities. Hearing the word “no” is too common for staff when staff request to attend a conference or course. Professional development should be a non-negotiable for managers and staff alike. Management should budget for staff professional development and staff should take ample advantage of these opportunities – those which cost and those which are free-of-charge. Why is professional development important for organisational development? Why should staff take advantage of professional development? 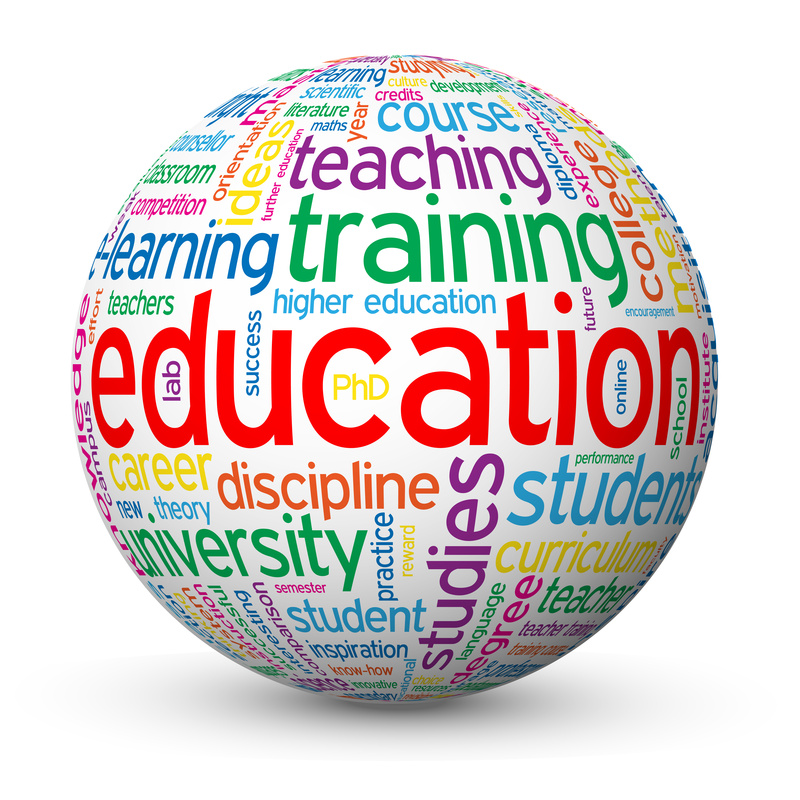 Professional development benefits both staff and employers. Managers who send staff to education courses, seminars, conferences, and webinars will find staff to be more enthused, engaged and loyal. Staff will find themselves to be knowledgeable about current trends and practices, gaining knowledge, and sharpening skills. Professional development is a life-long responsibility you and I have as managers, leaders and staff. I received an email from The Wilderness Society (TWS) this morning. The Email from TWS suggested they had a piece of returned mail sent to me at my Brisbane address and they sought my new contact details. Impressive. TWS is the first charity to ask for my new address! Their business process must be to send this automated email to anyone for whom they receive a piece of returned mail. I took immediate action, applauded them in my response, and sent my new address details. Kudos to TWS for best practice. This last week I was fortunate to be part of a talented panel of speakers talking about data at the Australian Event Manager’s Forum. This Forum meets once a quarter to talk about case studies and issues relating to the NFP sector and to event management. I shared with 60 people in attendance the fact I receive a call each week from a non-profit organisation asking for help in finding the “right fundraising software” for the organisation. The charity wants to find software that will deliver not only in the event space, but across the organisation. For some organisations, FundraisingForce conducts constituent relationship management (CRM) searches to find the right fit. Conversations can be had about the requirements of the organisation in order to find the right fit. But, put aside the software for a second and think about the practices that exist (or are likely absent) across the organisation. Too few in the charity space focus on the detail in a single supporter record in the database. We are too busy worrying whether the software we own does this task or that task. We are too busy completing transactions and tasks (i.e. booking a donation, getting the tax appeal out) that we do not take the time, while in possession of a supporter record, to do what I have called CEE a record. C – When in possession of a supporter’s record, no matter who you are in the organisation, Confirm the contact details with the supporter or Confirm the record is complete when you simply open a record to view information. E – Edit anything in the record the supporter tells you or you view as incorrect. E – Enhance anything in the record you see missing. Mobile phone numbers and email addresses are missing from about 70% of most charities supporter records. Do the above day to day, hour by hour. Once you have the day-to-day practices in place, you must focus on the masses. First, at the close of each month, someone on your team must troll the data base to look for known issues – incomplete records – addresses missing a post code, addresses missing a suburb, state, titles missing, etc. Make this one person’s job. Cleaning up the house once a month makes it a lot easier for major clean-ups. Your organisation needs to perform Data Hygiene at least once per year before a big mailing or event. Data Hygiene is the practice of cleansing the data, using a service provider who will access the Australia Post National Change of Address, NCOA, file on your organisation’s behalf. The service will also use other data sources and may enhance the data to offer you dates of birth, phone numbers or other enhanced information valuable for major gift and bequest efforts. Why do annual Data Hygiene? I have over 300 charities in my direct marketing mystery shopping study. I have lived in three apartments during the time the study has been underway. Some charities are mailing me at my address 3 apartments ago. I only receive the mail because I continue to renew my mail redirection service with Australia Post. Most Australians only renew their mail redirection once at best, if at all. Of the 300 charities in the study, only 3 have found me at my correct address. What do the other 297 charities do when a person does not file a mail redirection service? What do the other 297 charities do when a person does not continue to renew the mail redirection? Why don’t charities conduct an annual Data Hygiene process? They put it in the “too hard” bucket. They put it in the “too expensive” bucket. It is “too hard” if you do not understand the process. If you tried it once and it was “too hard”, find a supplier in the market to conduct the process and document it for you once. We can then transfer the knowledge to you to make it easy and allow you to be self-sufficient each time thereafter. I don’t buy this argument. It is very expensive to acquire a new donor. Sure Data Hygiene costs NFPs. But, it is less expensive to run a data hygiene process than it is to acquire a new donor. It is less expensive to do the Data Hygiene process annually than it is to continue to mail pieces, which do not reach their intended recipients. Unless you practice good Data Hygiene, the work done in terms of event fundraising, donor acquisition fundraising, and other areas do not matter. 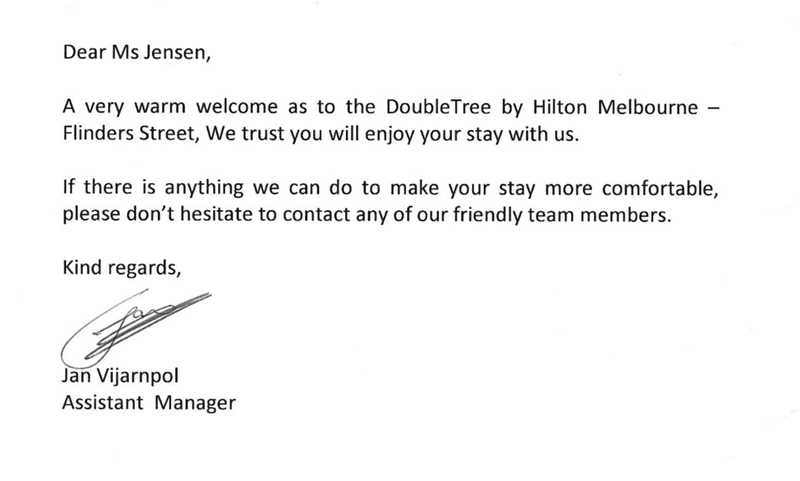 I checked into a Doubletree hotel last week and I found a box of chocolates and a note written to…not me, but Ms Jensen. I have been called a lot of names in my lifetime, but never Ms Jensen. When I received this note and the chocolates (which were placed in front of a television with the words “Doubletree welcomes Stephen Mally” on the screen), it made me think about the importance of accuracy in donor care. It made me think about the first thing someone does when they receive your non-profit organisation’s annual report or when they walk into the lobby of your building. The donor looks for their name on your donor honour wall/honour roll. Things can go very wrong at this point. We have all lived this nightmare – wrong spelling, wrong person, incorrect dollar category, or…a missing name altogether. I receive calls from people this time of year as they prepare donor listings for annual reports, donor walls, and other forums. “How do I accurately get lists out of The Raiser’s Edge?”, “Why are my anonymous donors coming out in a variety of ways”, “How do you track the way the donor actually wants to be listed on the donor wall?’. Make a new year’s resolution. Ask donor’s how they want to be listed in public forums. Create a place in your donor database to track donor listings. In The Raiser’s Edge, this place will be an Additional Addressee on the Addressees and Salutations Tab. Asking the donor for their preference, in advance, will save you the headache at end of financial year. Additionally, set a policy and a procedure for tracking anonymous gifts from donors. Taking the time now to determine the processes for thee types of donor care activities will save you headaches on New Year’s Day! I met with a fundraising colleague on 30 June, new year’s eve for most Australian charities, and we were monitoring how many charities had reached out to us on the final day of the financial year. I remarked how quiet it had been. I commented I had received a handful of emails asking me to make a gift in the final hours and I shared the fact I received one SMS. There are over 300 charities I mystery shop and I expected more. Perhaps I am a long lapsed donor to many and perhaps charities are scaling back on the volume of electronic direct marketing, as well as SMS, sent? Here is the one SMS I received. 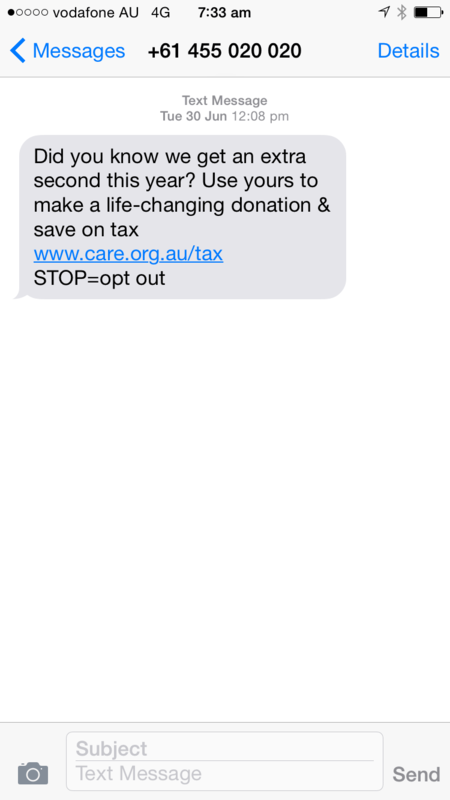 This SMS is from CARE Australia (not part of mystery shopping). What did your non-profit organisation do to attract donors to make a gift on the last day of the financial year? If you were in email in boxes, on mobile, you were likely one of the few. Tax time. It’s upon us. Stress about what it will bring, scrambling to find all your receipts and documentation, and regret about what you should have done are all factors this time of year. I was pleased to receive an Email on 25 June from one of the fundraising platforms allowing me to print my annual giving receipt. I was even more pleased when the platform encouraged me to make additional gifts to the charities I had supported and to encouraged me to make that gift in the closing hours of the financial year. It is my understanding that both GoFundraise and Everyday hero have this functionality and offer this end of year service. The tax time annual receipt functionality is of great assistance to those who may not have kept receipts throughout the course of the year. 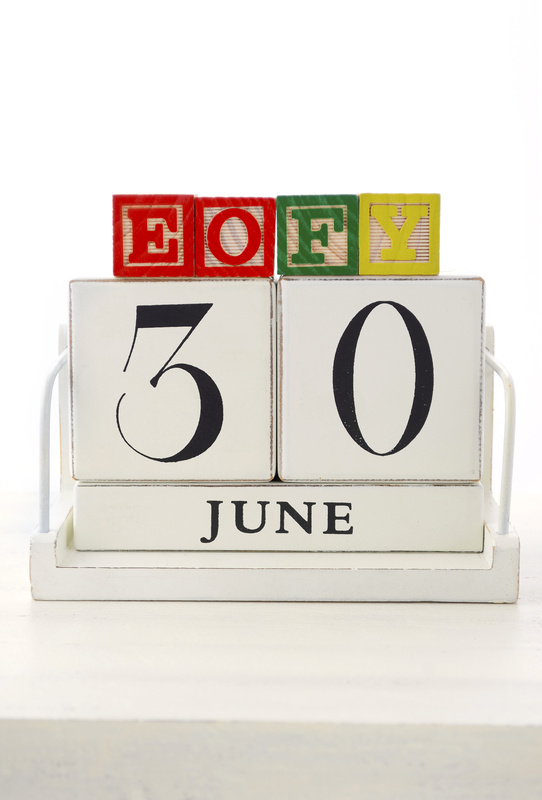 Additionally, the prompt to give an additional gift before midnight on 30 June is an added bonus for the donor and the charity alike. We have a lot going on in the final five days of the financial year and these sites make it easy for the donor by simply including a link to the giving page. Ease of use and convenience are two ways fundraising platforms make the donor and the charity’s lives easier. 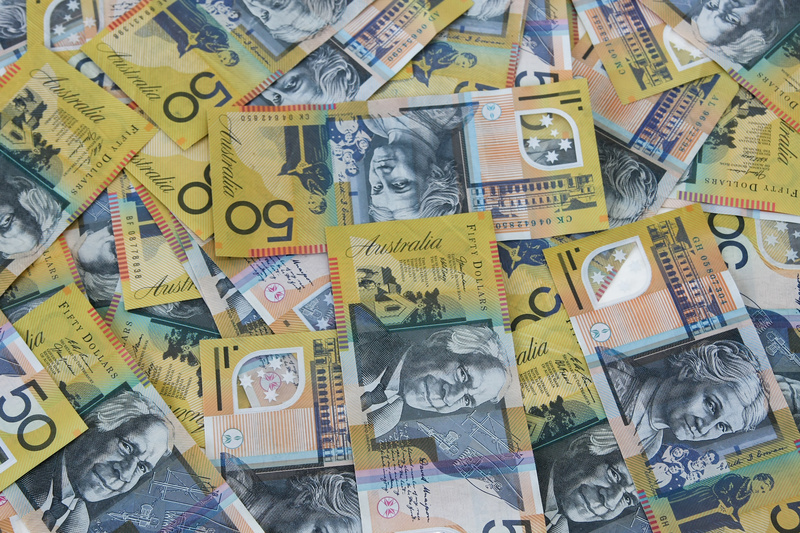 Hats off to GoFundraise and Everydayhero to leaders in the Australian marketplace. 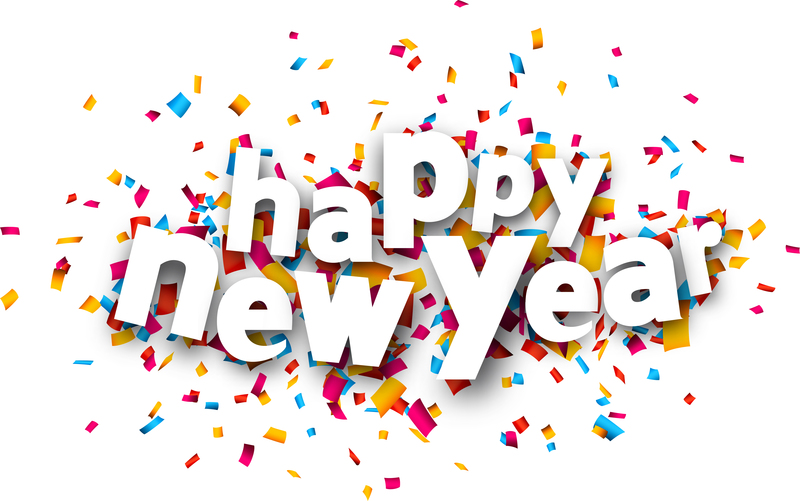 Happy New Year to non profit organisations across Australia! FundraisingForce wishes all of you a very productive new financial year!